Artist's illustration of NASA's Cassini spacecraft flying by Saturn's icy moon Enceladus. Cassini will make its deepest-ever dive through Enceladus' south polar plume on Wednesday (Oct. 28). Scientists are about to get their best look ever at the ocean that sloshes beneath the surface of Saturn's icy moon Enceladus. On Wednesday (Oct. 28), NASA's Cassini spacecraft will zoom just 30 miles (50 kilometers) above Enceladus, flying through and sampling the plume of material that erupts from the satellite's south polar region. "On Wednesday, we will plunge deeper into the magnificent plume coming from the south pole than we ever have before, and we will collect the best samples ever from an ocean beyond Earth," Curt Niebur, Cassini program scientist at NASA Headquarters in Washington, D.C., said during a news conference today (Oct. 26). Cassini is not equipped to search for signs of life, but the probe's measurements should help researchers assess the habitability of Enceladus' global ocean, Niebur added. There are three main science objectives for the flyby, said Cassini project scientist Linda Spilker, who's based at NASA's Jet Propulsion Laboratory in Pasadena, California: The mission team aims to confirm the presence of molecular hydrogen in the plume, which would provide evidence for hydrothermal activity (a potential energy source for life) in the ocean. The team also hopes to characterize the plume's chemistry (perhaps finding previously undetected organic compounds) and determine the nature of the plume sources (discrete jets versus broader, curtainlike eruptions). The flyby will occur at about 1 p.m. EDT (1700 GMT) Wednesday. Cassini will check in with mission control about 3 hours later, but the first encounter images likely won't be released until late Thursday or early Friday, Spilker said. 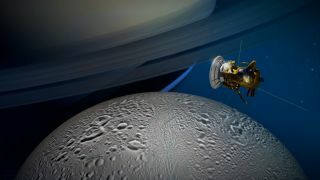 Scientists will probably get their first quick look at Cassini's spectrometer data on the sampled plume particles within a week after the flyby, but more in-depth analysis may take several weeks, she added. Wednesday's close encounter will mark the 21st flyby of Enceladus for Cassini, which has been orbiting Saturn since 2004 and discovered the moon's icy geysers in 2005. Cassini has flown through the plume before, but its previous closest approach to the south polar region was 50 miles (80 km). So Wednesday's event is pretty special, Spilker said. "There's a lot of excitement about this particular flyby," she said. "We're certainly all eagerly awaiting the scientific results from this deep plunge through the plume." After Wednesday, Cassini will have one more flyby of Enceladus remaining before the end of its mission, in September 2017. On Dec. 19 of this year, the spacecraft will cruise within 3,106 miles (4,999 km) of the icy satellite, making observations that should allow mission scientists to gauge the heat flowing from Enceladus' interior. The $3.2 billion Cassini mission, a joint effort involving NASA, the European Space Agency and the Italian Space Agency, launched in 1997.